Defense Secretary Chuck Hagel will visit Marine Corps Air Station Miramar Tuesday afternoon on his last official domestic trip to thank service members and their families. Hagel and his wife Lilibet are visiting personnel from each service who support some of the nation’s most critical missions, including the ongoing rebalance to the Asia-Pacific region, strategic nuclear forces, and ongoing operations in Afghanistan and Iraq. He will stop first at Whiteman Air Force Base in Missouri to meet with airmen of the 509th Bomb Wing who pilot and support the B-2 Spirit Stealth Bomber. From Whiteman, the secretary will fly to Miramar, “one of the bases that make San Diego the largest U.S. military and veteran community in America,” according to Pentagon Press Secretary Navy Rear Adm. John Kirby. Miramar is home to the 1st Marine Expeditionary Force, and Kirby said the secretary looks forward to thanking the Marines there, including those who recently returned from Afghanistan and those who are preparing to deploy there to support Operation Inherent Resolve. 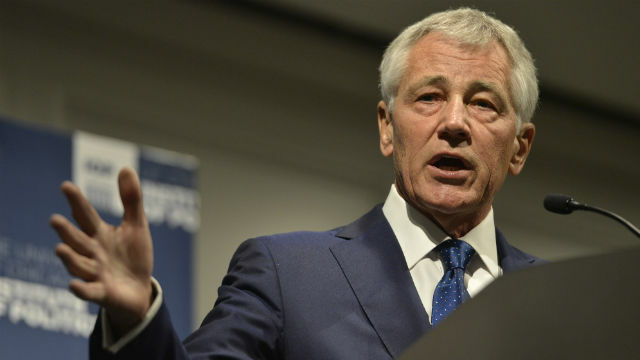 On Wednesday, the press secretary said, Hagel will fly out to the amphibious assault ship USS America, one of the newest ships in the Navy fleet. The ship is undergoing predeployment workups off the Pacific coast. Hagel’s last will be Thursday with a visit to Fort Bliss, an Army post in Texas and New Mexico, where he completed basic training in 1967.